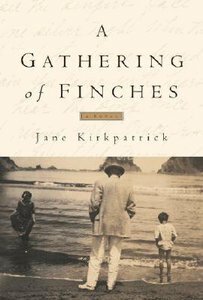 Based on historical characters and events, A Gathering of Finches tells the story of a turn-of-the-century Oregon coastal couple and the consequences of their choices, as seen through the eyes of the wife, her sister, and her Indian maid. Along the way, the reader will discover reasons to trust that money and possessions can't buy happiness or forgiveness, nor permit us to escape the consequences of our choices. The story emphasizes the message that real meaning is found in the relationships we nurture and in living our lives in obedience to God. - Publisher Lottie, my Coos Indian maid, called it "the going over place. "^^So begins the tangled tale based on the life of Cassie Hendrick Stearns Simpson, who crossed the Oregon coastal tidewaters in 1899 to begin her life beside the prosperous entrepreneur Louis Simpson on Oregon's wild and rugged coast. Cassie seemed to have it all: an adoring husband, a loving sister, a daughter, and social position. She inspired a luscious four-acre garden that today is an Oregon state park. She had wealth to buy anything her heart desired. But fluttering beneath the surface of her seemingly charmed life were self-doubt, fear, and the consequences of poor choices. All robbed her heart of peace, and left her empty and still longing for something more. Others attempted to lead her toward decisions that would bring her peace, but as with each of us, only Cassie could make the choices that would truly change her life. About "A Gathering of Finches (#03 in Dreamcatcher Series)"
Lottie, my Coos Indian maid, called it "the going over place. "^^So begins the tangled tale based on the life of Cassie Hendrick Stearns Simpson, who crossed the Oregon coastal tidewaters in 1899 to begin her life beside the prosperous entrepreneur Louis Simpson on Oregon's wild and rugged coast. Cassie seemed to have it all: an adoring husband, a loving sister, a daughter, and social position. She inspired a luscious four-acre garden that today is an Oregon state park. She had wealth to buy anything her heart desired. But fluttering beneath the surface of her seemingly charmed life were self-doubt, fear, and the consequences of poor choices. All robbed her heart of peace, and left her empty and still longing for something more. Others attempted to lead her toward decisions that would bring her peace, but as with each of us, only Cassie could make the choices that would truly change her life. Jane Kirkpatrick is the author of twenty-five books and is a two-time winner of the WILLA Literary Award. Her first novel, A Sweetness to the Soul, won the Western Heritage Wrangler Award, an honor given to writers such as Barbara Kingsolver and Larry McMurtry. For twenty-six years she 'homesteaded' with her husband Jerry on a remote ranch in Eastern Oregon. She now lives with Jerry, and her two dogs and one cat on small acreage in Central Oregon while she savors the value of friendship over fame. Based on historical characters and events, A Sweetness to the Soul recounts the captivating story of young, spirited Oregon pioneer Jane Herbert who at the age of twelve faces a tragedy that begins a life-long search for forgiveness and love. In the years that follow, young Jane finds herself involved in an unusual and touching romance with a dreamer sixteen years her senior, struggles to make peace with an emotionally distant mother, and fights to build a family of her own. Filled with heart-warming insight and glimpses of real-life pain, A Sweetness to the Soul paints a brilliant picture of love that conquers all obstacles and offers a powerful testimony to the miracle of God's healing power. Based on historical characters and events, Love to Water My Soul recounts the dramatic story of an abandoned white child rescued by Indians. Among Oregon's Paiute people, Shell Flower seeks love and a place of belonging...only to be cast away from her home. Based on historical characters and events, Love to Water My Soul recounts the dramatic story of an abandoned white child rescued by Indians. Among Oregon's Paiute people, Shell Flower seeks love and a pace of belonging...only to be cast away from her home. In the years that follow, she faces a new life in the world of the white man--a life filled with both attachment and loss--yet finds that God faithfully unites her with a love that fills all longing in this heartwarming sequel to Jane Kirkpatrick's award-winner, A Sweetness to the Soul.